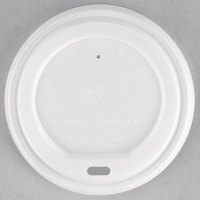 Hot paper cup lids are essential for take-out locations and other businesses where customers can quickly pop in, order their favorite beverage, and go on their way. Paper cup lids come in both white and black for simple color coordinating, and there are also lids with flat, sip through, or tear tab designs. 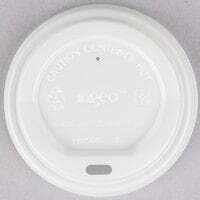 Best of all, several of these hot cup lids are made to be eco-friendly to reduce your business's carbon footprint. Also make sure to check out other great items from Choice, EcoChoice, Dart Solo and Eco Products. Our selection of hot paper cup lids is designed to make sure your customers can enjoy their favorite drinks without the risk of spills or burning their mouths on fresh product. These paper cup lids are sized to fit cups of nearly any size, and their round shape lets them simply snap onto cup rims for simple use. Whether you're serving your customers a new recipe or their old favorites, these hot cup lids are perfect for your needs. For additional products to go with your new paper cup lid, check out our selections of coffee stirrers, beverage napkins, and coffee sleeves. If you're wondering where to buy ecochoice paper hot cup lids, we have a large selection of ecochoice paper hot cup lids for sale at the lowest prices.